Pot holders and oven mitts don't really need a tutorial . . . and yet, I'm doing one anyway. It's a disease! The pretend and play restaurant set is well underway! 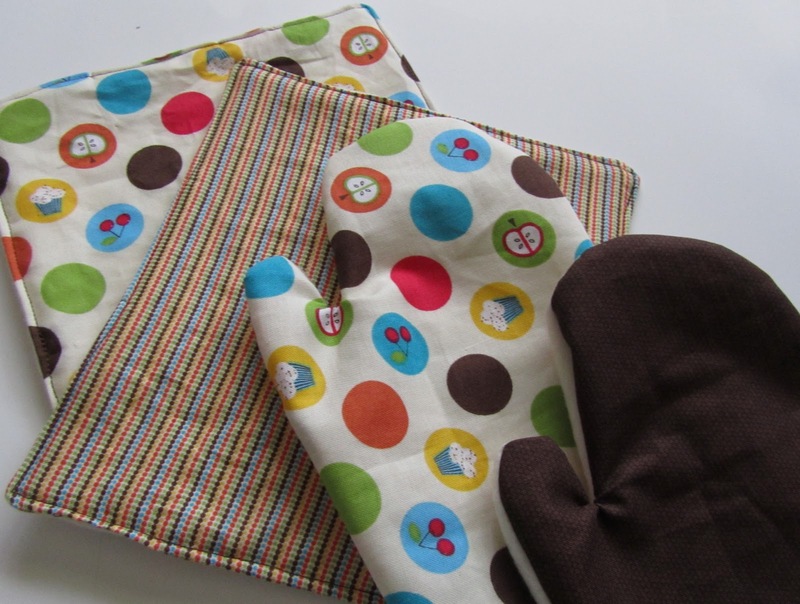 Now we have coordinating oven mitts and pot holders. 1) Trace child's hand and use the traced hand to make sure the oven mitt will be larger than the hand. Or trace around a child's mitten adding a few inches all the way around perimeter for the oven mitt pattern. Leave an extra 1/2 inch on the bottom of the non-fleece mitt shape. Cut out two mitt shapes for each oven mitt. 2) Cut the bottom of the fleece mitt shape with pinking shears. 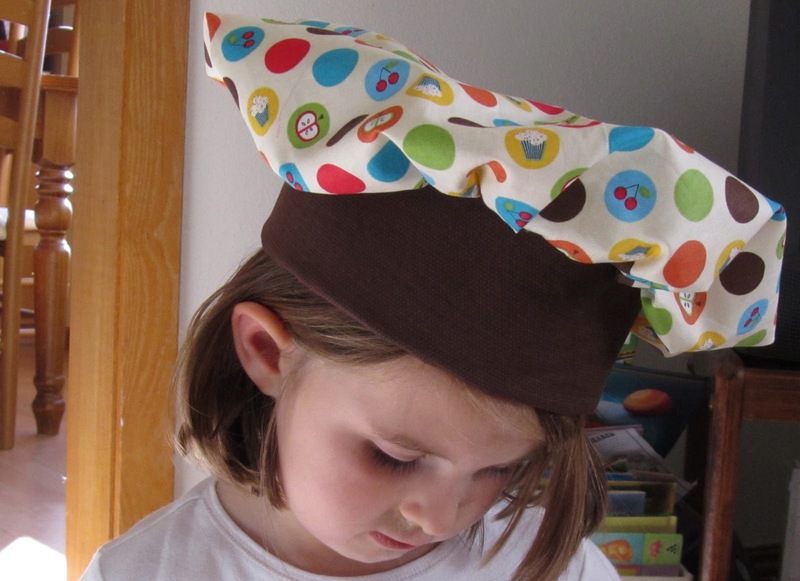 3) Pin the two mitt shapes right sides together just at one side. 4) Double fold the end of the non-fleece mitt shape and pin. With a zigzag stitch sew a hem down the bottom of the mitts pinned together. 5) Pin the mitt shapes right sides together all the way around. Sew. Clip rounded corners and turn. The pot holders are pretty self-explanatory . . . so let me explain them ;). Cut out two squares. Pin them right sides together. Sew around leaving a turning hole. Clip corners. Turn. Top stitch around edge closing up turning hole in the process. I think I'm gonna have to make this set for my cousin's little girlie girl!! It's so cute! Very sweet! They'll have so much fun with these! So awesome! And... you can never have too many tutorials. In my opinion, at least. What a cute set! I love the fabric!! That little play set would make a darling gift :) Love it! 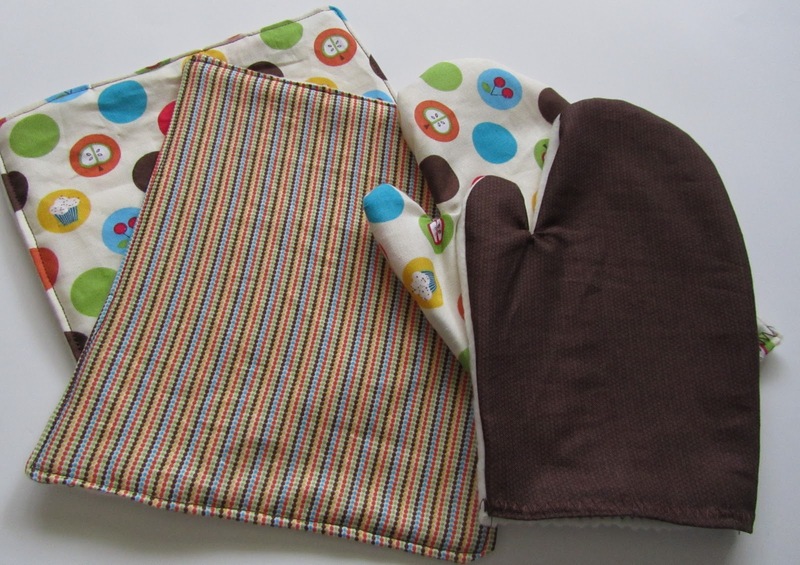 Your oven mitts and hot pads are very cute! The fabric you chose is so fun! What a great gift idea. My daughter's and niece would love this! Thanks for sharing! i just made mine today. thanks so much for the tutorial. i know i could have made one on the fly but your directions, and pictures helped tremendously! it looks so professional and perfect (besides the fact i was too lazy to change my thread). Faye, I would love to see pics!! I'm so glad the tutorials worked for you.